The Malaysian Rubber Board Europe, is pleased to invite you to Alihankinta 2015 at the Tampere Exhibition & Sports Centre, Tampere, Finland from 15th - 17th September 2015. Stand A1134. 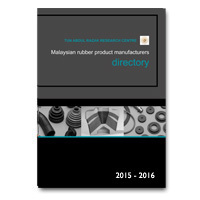 If you are looking to source high quality, competitively-priced rubber-based products come and claim your FREE 2015 Directory of all Malaysian rubber product manufacturers and materials and machinery suppliers from our stand at A1134. Here at the Malaysian Rubber Board Europe, we can supply details and advice about the numerous Malaysian manufacturers exporting rubber products worldwide. Alternatively, if you are looking to transfer your own manufacturing operations overseas, why not come and talk to us and learn more about the many incentives and attractions Malaysia has to offer. Consider for the first time Malaysia as your potential trading partner. If you would like to take advantage of Malaysian Rubber Board Europe's in depth knowledge of the manufacturing industry in Malaysia and what it can offer you, please e-mail us and state which day you would like to meet. Come and talk to us and see what makes Malaysia such an exciting business partner. If you have any questions or want to arrange a meeting at Alihankinta 2014 please call David Cawthra or Gail Reader on +44 1992 584966.